Originally from Corner Brook, Trent McClellan is known for his approachable, candid and effortless observational comedy, and may be best known for his role on CBC’s This Hour has 22 Minutes. 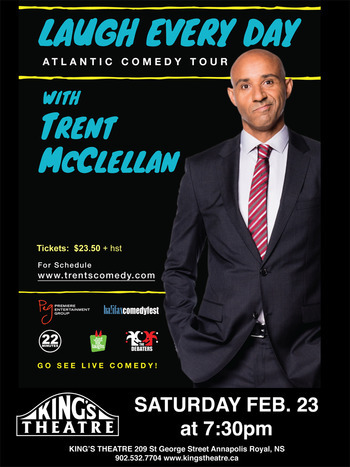 He has had numerous filmed television performances from Just for Laughs, Winnipeg and Halifax Comedy Festivals, and comedy specials for CTV and the Comedy Network. Trent can also be heard on CBC’s The Debaters, and he was a panelist on CBC’s Canada Reads. Trent developed a podcast series called The Generators, available on TuneIn Radio and on iTunes. All tickets are $23.50 + hst = $27.